MJ Fire Safety have decades of experience testing and repairing dry and wet risers. If you have a dry or wet riser system in any of your properties our dedicated riser team are just what you need. All our testing is completed by expert engineers in line with BS9990: 2015. As a result our proven track record & high standard of service has earned us a reputation to be proud of. We are responsible for testing dry risers on a number of council contracts & we also work closely with a huge number of private sector clients. Our experienced staff and efficient office systems together with our flexibility in terms of attendance times allows us to offer the complete dry and wet riser service. MJ Fire Safety offer a free survey and consultation service. 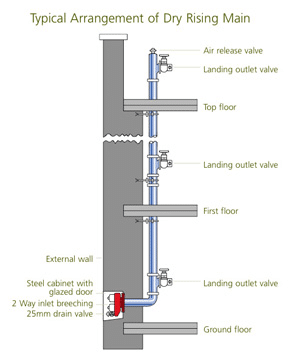 We will work with you to ensure you have a fully operational Dry or Wet Riser installation. Dry risers should be wet pressure tested annually and receive a minor inspection six months later. Wet risers are subject to an annual inspection. Furthermore please note that any associated pumps are subject to their own more frequent maintenance requirements. Call us today to discuss your dry and wet riser requirements. Alternatively please email us and we will get back to you as soon as possible.